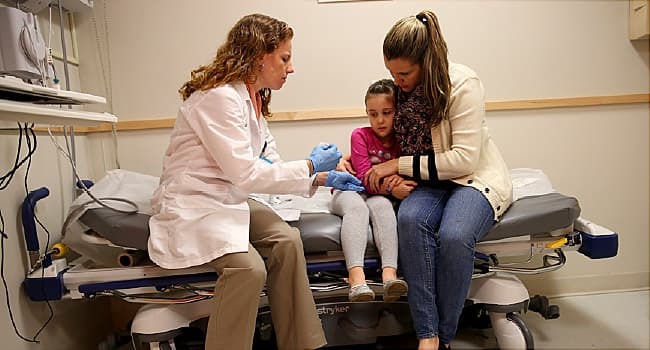 Feb. 8, 2019 -- Karen Dahl, MD, sees the ongoing U.S. measles outbreak with a silver lining: An opportunity to educate parents about vaccines, and perhaps to change the minds of some who are against childhood vaccinations. "Overall, we have a fairly high level of vaccination," says Dahl, an infectious disease specialist and vice president of quality and patient safety at Valley Children's Healthcare in Madera, CA. "MMR is probably the one vaccine that there is the most misinformation on and the most resistance to," says Dahl, speaking from her own experience. "Most don't have concerns about, say, the tetanus vaccine." "If you can get a parent to accept one vaccine and have a good response, it opens the door to more conversations," she says. Overall, the biggest fear among those hesitant to vaccinate, she says, is a fear of a link to autism, which experts have ''absolutely debunked." She tells parents that autism is often diagnosed at 1 year, about the same time the first of two recommended vaccine doses is given, and that alone does not suggest cause and effect. The CDC recommends the first dose at 12 to 15 months and the second at 4 to 6 years. Another reason some may not see the need to vaccinate is not being familiar with the disease. The U.S. measles vaccine program started in 1963, and Dahl says many of today's parents -- or even their parents -- have never seen a case of measles. "They are not afraid of measles, they have never seen it, and they have no personal stories [about it]," she says. "The measles is a rash, a fever and a cold," says Hildebrand, who has not vaccinated her daughters, now 10 and 13. "It's not a crisis. We've made it into a crisis because the vaccine is available." "Most people find the personal stories more convincing than data," she says. "Numbers and data appeal to scientists and doctors, but they don't convince the general public." Even so, she doesn't leave out statistics entirely in her conversations with patients. According to the CDC, 1 or 2 of every 1,000 children getting measles dies. "We have to make sure people know, you can die from measles, and under age 5 is high risk," Dahl says. "The law changed the landscape dramatically," says Dennis Woo, MD, a pediatrician at UCLA Medical Center, Santa Monica, and associate professor of pediatrics at UCLA's David Geffen School of Medicine. "Before, all you had to say was 'I prefer not to [vaccinate],''' he says. Medical reasons include a child on chemotherapy, a child with a known allergy to one of the vaccine ingredients, or with a child diagnosed with a severe immune deficiency. Parents who can't provide a medical reason and don't want to vaccinate may choose to home school. Or they may skirt the law, Woo says. "There is a small black market," he says. "There are doctors out there who for a price will write a letter." He has had such requests and declines, he says. Today, he says, "I don’t have any patients in my practice who are not immunized." He does often have the risk-benefit discussion, he says. In his experience, Woo says that ''a lot of the people who don't immunize make the decision more on an emotional basis than having really done all the reading." When parents worry about giving too many vaccines at once, Woo will accommodate them somewhat to ease their fears and stretch out the schedule a bit. For instance, "if they are due for four shots in one day, I'll say, ‘OK two one day and the other two in a week,’" he says. But he tells them: "If you stretch it out too far, you are leaving your children vulnerable." Karen Dahl, MD, pediatrician and infectious disease specialist; vice president of quality and patient safety, Valley Children's Healthcare, Madera, CA. CDC: "Frequently Asked Questions About Measles in the U.S.," "Complications of Measles." National Conference of State Legislatures: "States with Religious and Philosophical Exemptions for School Immunization Requirements."